About a couple of years ago now, I took an online course called Finding Your Voice. I knew that I had a recognizable photographic style, but it came from within; it was simply my way of seeing the world and therefore difficult for me to precisely pinpoint. I wanted to approach my photography as a form of art – from the planning of the shoot through to the editing – and this is where this course was a game-changer for me. Today’s world is very visual. There are photos everywhere. My first task in finding my own visual identity was to collect photographs and decide if I admired them or if I was attracted to them; an important distinction. Those which I admired were beautiful to look at, but weren’t how I would see myself taking photos. However, those which I felt attracted to, I was very much envious of their photography talent and was desperate to recreate it! A lot more collecting and deciphering took place and luckily, I came to a few conclusions along the way! I needed to make my photos look a particular way and then I needed to figure out how to make them feel a certain way too. My look is ‘on location’, where my subject is bathed in natural light within a beautiful outdoor setting (and we are spoilt for choice here on Dartmoor, from open moorland, to woodland, to tree-lined meadows…). I like to keep clothing simple and timeless by avoiding heavy patterns and logos in order to keep the focus on my subject rather than on the clothes. My style is quite classical and still, rather than more documentary-style and full of energy. My photographs are a little more posed – or frozen still in a moment, but it doesn’t mean that my subjects are expected to stand and pose. Or to be serious! I get to know my subjects and play along with them until they open up to me and the camera, and it’s only once they are relaxed that I am able to capture these wonderful, whimsical moments of childhood. Your gallery would most likely include some big belly laughs (and maybe a few strops!) but the photos I would be drawn to are those still, reflective moments. They get me every time! This very much leads into the feel of my photography. 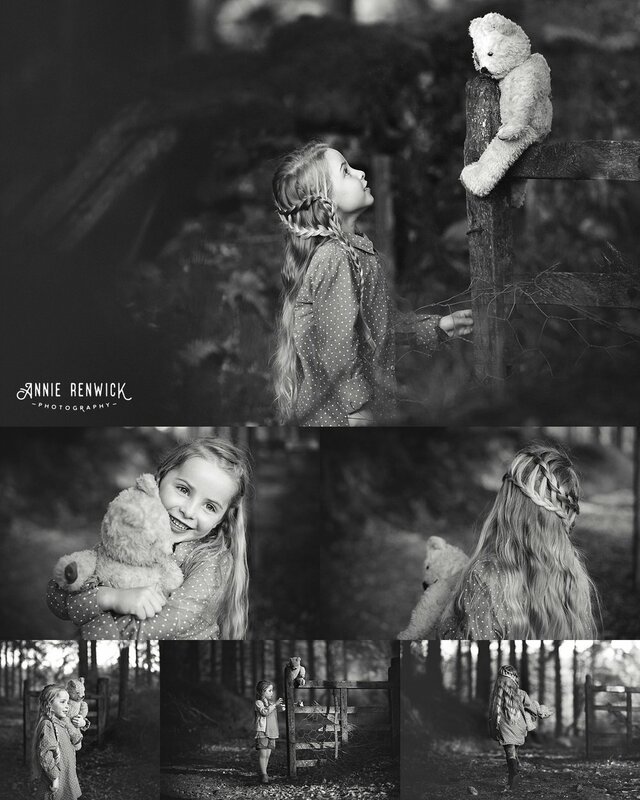 I like to capture an air of yesteryear and the feeling of nostalgia in my child portraits. Childhood is a fleeting moment and it’s one I strive to capture for you as parents as much as for your children – to lock in a location, an inseparable soft toy or a pair of special wellies that will bring so many memories in years to come. I want to capture genuine emotion, natural expressions and your children being allowed to be completely themselves. I hope you have enjoyed this little insight into who I am as a photographer. If you would like to see more of my work, please visit my portfolio, and if you would like to know a little more about my photography journey click here. A huge thank you goes out to Rebecca who gave her time and energy and shared her passion for hair-styling with these beautiful girls. If you love the look of these photographs please let us know and we will happily organize a weekend of beautifully styled shoots for you.